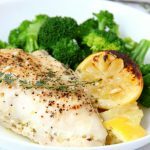 Easy Lemon Chicken – Juicy and tender chicken breasts baked in a lemon-herb sauce brimming with delicious lemony flavor! I’ve always had a curiosity about lemon chicken. How many of you used to watch Everybody Loves Raymond on TV? I remember that lemon chicken was the one dish that Debra (Raymond’s wife) was good at making. Otherwise, everyone saw her as a horrible cook. Poor Debra. There’s just something about lemon chicken that has always appealed to me. 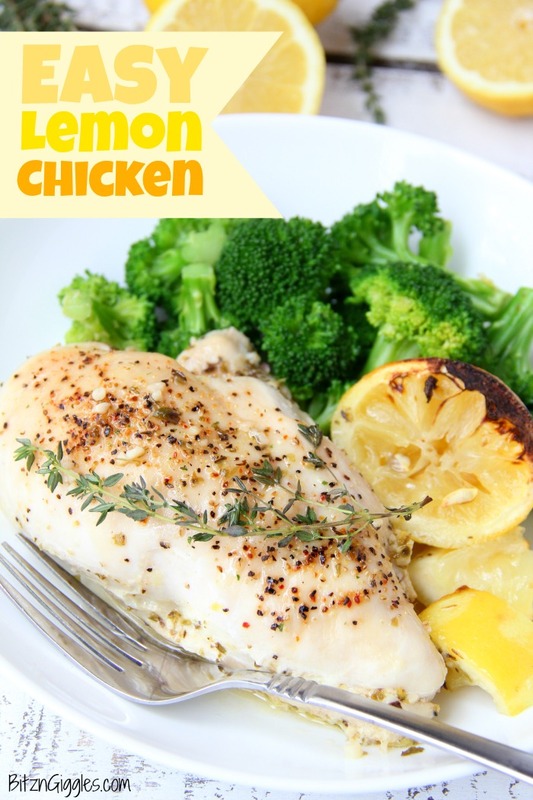 The lemon+chicken combo is light, fresh and flavorful. A perfect spring recipe. 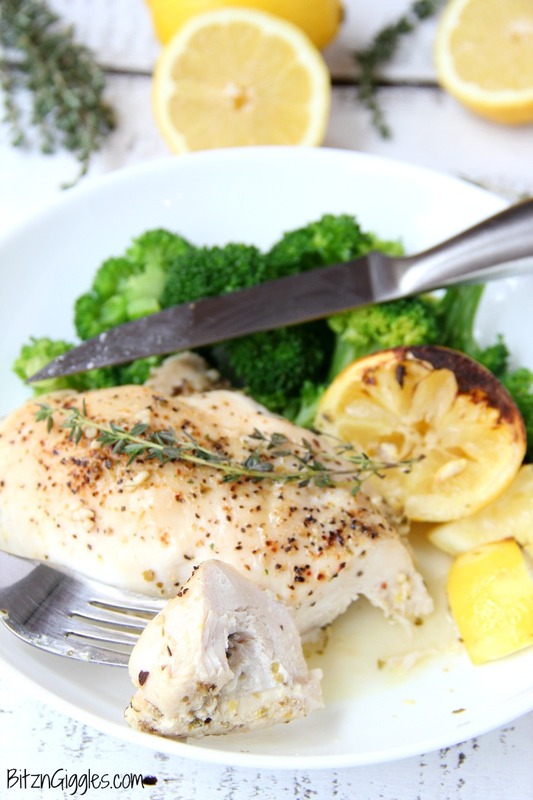 This Easy Lemon Chicken recipe that I’m sharing today calls for chicken breasts rather than a whole chicken or chicken parts. I don’t know about you, but when I cook chicken during the week, it’s normally chicken breasts. I save roasting a whole chicken for the weekend when I have a little more time. If I want a whole chicken during the week, I buy a rotisserie chicken from our local grocery store’s deli. 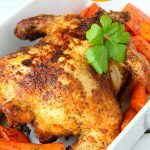 Not to go off on a tangent here about chicken, but rotisserie chicken can be used for so many yummy and quick casseroles, like this one. Chicken. Chicken. Chicken. There, I feel so much better. 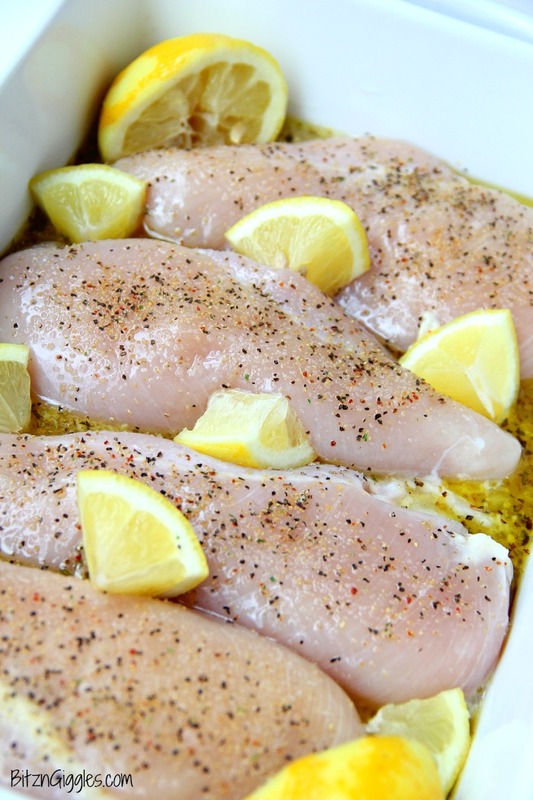 There’s also something about surrounding chicken with lemons that’s really appealing, too. Have you ever seen raw chicken look this pretty? Notice the halved lemons in the corners of the pan? The recipe calls for some lemon zest. For zesting, I use a Microplane grater. If you’re anything like me, you may need one of these, too. Safety first, right? So how do you zest a lemon? When you zest a lemon you only want to remove the yellow part of the rind. The white part is going to be bitter. If there is one mistake readers may make in this recipe it’s the lemon zesting. ONLY zest the yellow part and everything will be fine. Moving on. . .
Once baked, the color of the chicken will still be pretty light. If you want to brown it a bit more, you can always brush the top of the chicken with some olive oil and put it in the oven under the broiler for a few minutes. How pretty is that? 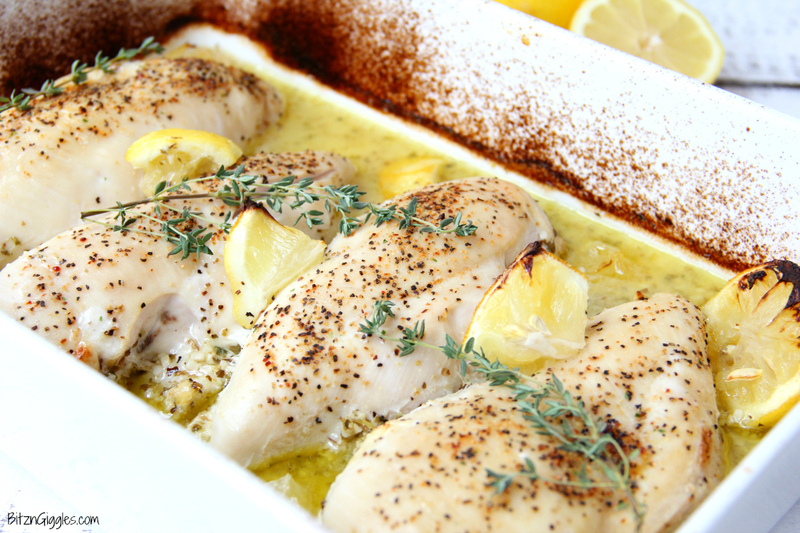 One of the things I really love about this lemon chicken recipe is that the chicken comes out really flavorful. 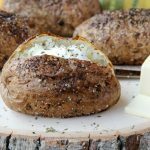 Have you ever baked a chicken breast in the oven with lackluster results? Like you thought you really seasoned it well, but when you taste it, the only flavor that comes out is from the very top of the chicken. It’s really quite flavorless throughout the rest of the breast? Such a nice change from your ordinary, flavorless chicken breast. For sure. 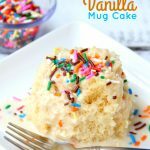 I hope you try the recipe and I can’t wait to hear your thoughts. What a perfect way to welcome in spring! 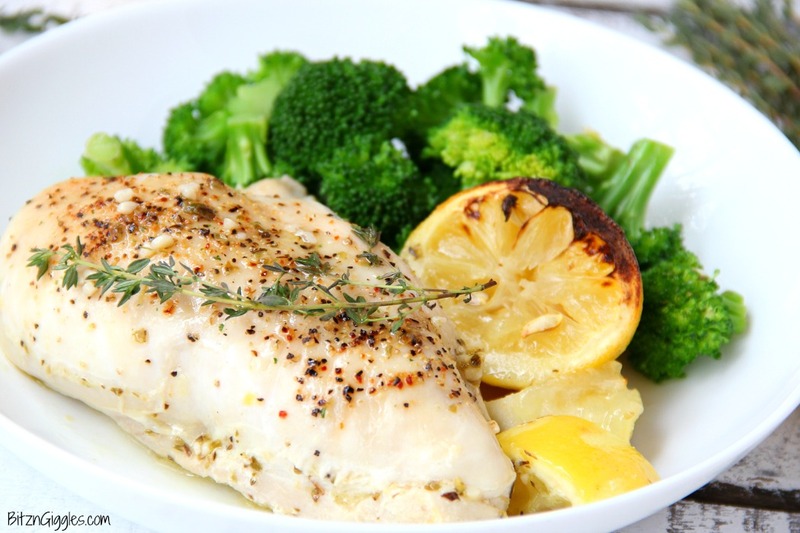 Juicy and tender chicken breasts baked in a lemon-herb sauce brimming with delicious lemony flavor! Warm the olive oil in a saucepan over medium heat. Remove pan from burner and add the white wine, oregano, thyme and teaspoon of salt. Add the zest of two lemons to the pan and mix. Transfer the sauce to a 9×13 inch baking dish. Place the chicken breasts over the sauce. Season them with salt and pepper, to taste. 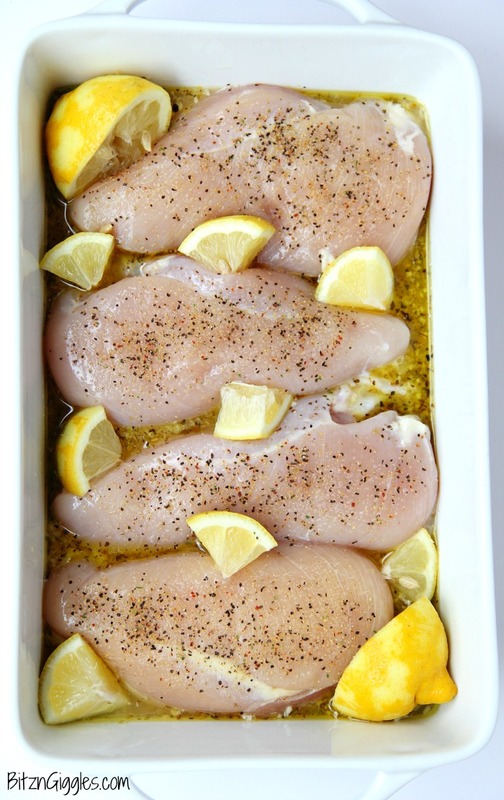 Cut the two zested lemons in half and place in corners of pan next to chicken. Cut the last lemon into 8 wedges and tuck them around the chicken breasts. Bake for 40 minutes until the chicken is fully cooked. For extra browning, brush chicken with some olive oil and place under broiler for 3-4 minutes. Drizzle the sauce over the chicken breasts and serve. 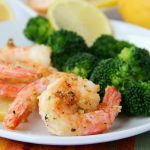 Sarah, you’ll be surprised at how flavorful it is even with no marinating!